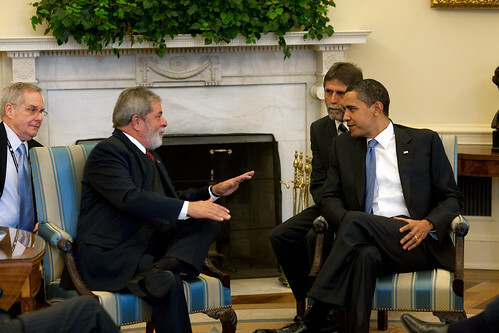 Lula da Silva of Brazil in the Oval Office, March 14, 2009. Most mainstream media coverage won't explain the massively lucrative nature of the Haiti venture to the US, the United Nation and Brazil. The financial interests in "their plan" for Haiti. The general spin is that the fundamental motivation of this trade initiative was humanitarian to aid Haiti's economic development through sustainable production activity. The authorities in the US, UN and Brazilian governments won't explain that the Brazilian-headed UN troops are, by-the-way, in Haiti not only to secure the use of cheap Haitian labor for their transnational corporations, exploit Haiti's natural resources, but also to defend Brazil's dream of becoming more of a status quo power itself and gain a seat in the UN Security Council. Brazilian corporations have successfully lobbied Washington and made Brazil a beneficiary under the Washington HOPE Act that allows for duty free textile goods from Haiti for 10 years. That means, for instance, the Brazilian company, Coteminas - Latin America's largest textile company, owned by the brother-in-law of Brazilian President, Luiz Inacio Lula da Silva. Brazil will be able to make clothing in Haiti or the Dominican Republic and ship them to the US with preferential treatment. Currently, Brazil is the top maker of textile in the region. The textile empire is owned and controlled by President Lula's brother in law. Brazil retained a high-powered law firm in DC to broker the trade deal in Washington. "In the midst of chaos [the chaos of the Haitian economic situation and earthquake disaster], Brazilian companies are searching for opportunities and are beginning to profit from their strategic position as leader of MINUSTAH. Coteminas [Brazilian giant of the textile sector, whose chairman is none other than the son of the vice president of Brazil] wants to use Haiti as a platform for export and clothing manufacture aimed at the US. Brazil is a known collaborator in the rescue process of Haiti. Our country has the right to demand preferential treatment, said Valor Josue Gomes da Silva, president of Coteminas. In spite of institutional confusion, Haiti presents important advantages for a company in the textile sector: proximity and access to the biggest market in the world, the US, and very inexpensive labor. 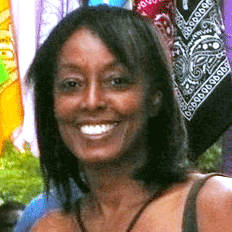 A dressmaker for the capital Port-au-Prince is paid $0.50 an hour. That is a wage lower than the $3.27 paid in Brazil, and comparable to the $0.46 of Vietnam and $0.28 of Bangladesh." Coteminas' plan is to export fabric from Brazil, have it made into clothes in Haiti at very low cost, and enter the US market without customs duties. The whole process protected by free trade agreements. Oil Developers want the Island of La Gonave: Is Haiti For Sale? Momment of Zen: Palin "Going Rouge"